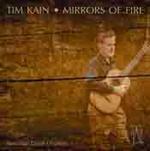 Mirrors of fire : Australian guitar originals / Timothy Kain, guitar. River : guitar prelude no. 2 ; Mirrors of fire : guitar prelude no.3 / Richard Vella ; edited by Timothy Kain. 1 vol. of music (21 p.) ; 30 cm.